Following through on the sweeping energy initiatives he outlined last December, Governor Tim Pawlenty signed the Next Generation Energy Act of 2007 [on May 25th]. The Governor's energy plan puts Minnesota squarely at the front of states leading the way toward our nation's energy future. The legislation signed today will increase energy efficiency, expand community based energy development, and establish a statewide goal to reduce greenhouse gas emissions and supplements the aggressive 25 x '25 renewable energy standard proposed by the Governor and signed earlier this year. “The best time to have taken action on energy issues would've been 30 years ago. The second best time is right now," Governor Pawlenty said. "The nation has been asleep at the switch, but here in Minnesota we are kick-starting the future by increasing our nation-leading per capita renewable fuel use, boosting cost saving measures and tackling greenhouse gas emissions." Governor Pawlenty first introduced his Next Generation Energy Initiative in December 2006 to provide more renewable energy, more energy conservation, and less carbon emissions for Minnesota. Following the framework developed early in the legislative session with the passage of the nation’s most aggressive Renewable Energy Standard, the Next Generation Energy Act establishes nation-leading requirements on Minnesota’s electric utilities while ensuring reliability and protecting the cost-competitiveness of Minnesota’s electric system. The legislation received overwhelming bipartisan support and was co-authored by Rep. Bill Hilty and Senator Yvonne Prettner Solon. Energy Savings Goals: The Demand Efficiency Initiative builds on Minnesota’s existing conservation program, consistently ranked in the top five programs in the country. It will effectively double the amount of energy saved by Minnesota’s utilities by transitioning Minnesota from energy efficiency spending goals to energy efficiency savings goals. The bill also sets a goal of 1,000 Energy Star Buildings in Minnesota by 2010 and provides adequate funding to achieve the goal. Community Based Energy Development: The Next Generation Energy Act expands and strengthens Minnesota’s commitment to the development of locally-owned renewable energy projects. Previous legislation also increases funding for community energy outreach through Clean Energy Resource Teams (CERTS) throughout the state. Climate Change and Greenhouse Gas Reduction: According to the National Conference of State Legislators, the Next Generation Energy Act propels Minnesota into the top two states (with California) leading the way towards reducing greenhouse gas (GHG) emissions. 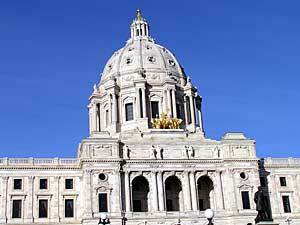 The bill establishes statewide GHG reduction goals of 15 percent by 2015, 30 percent by 2025, and 80 percent by 2050. The bill also endorses the Governor’s Minnesota Climate Change Advisory Group as the entity to develop a comprehensive greenhouse gas emission reduction plan to meet those goals. 25x’25 Renewable Electricity Requirements The nation’s most aggressive Renewable Energy Standard requires Minnesota’s electric utilities to provide 25% renewable electricity by 2025.
o $15 million for bioenergy, biomass electricity, biofuels, plug-in hybrid technologies, renewable hydrogen and solar technology projects. o $17 million for energy research, including funding for the U of M Initiative for Renewable Energy and the Environment. o $3 million to double the number of E85 stations in Minnesota from the nation-leading 300 stations to 600 stations. In addition, the NextGen Energy Board is established and will begin meeting next month to develop bioenergy and biofuels policies and recommendations. Well done Minnesota! If you're interested in the development and debates surrounding these bills, head over to www.energista.org and poke through their archives for lots of detailed posts discussing the renewable energy standard and the Next Generation Energy Initiative. Senator Maria Cantwell (D-WA) introduced a new energy bill to Congress last week that would provide long term extensions of several key clean energy tax credits, including the Federal Production Tax Credit. The bill, the "Clean Energy Investment Assurance Act of 2007" (S.6020) has been co-sponsored by Senators Gordon Smith (R-OR) and John Kerry (D-MA). Provide a sufficient duration to the incentives for investment in and wide-scale deployment of renewable energy technologies. Provide incentives for improved efficiency to reduce energy consumption and enhanced management of energy demand. Set an overall goal for the tax incentives—production of energy resulting in zero carbon emissions—and enable all technologies to become cost competitive within the defined timeframe of the incentives. Extends the Production Tax Credit (PTC) for renewable energy generation through Dec 31st, 2013. Expands the PTC to include thermal energy production technologies utilizing renewable energy to produce useful heating or cooling (i.e. solar hot water heating, biomass for heating, etc.). Specifies that the PTC applies to any zero-carbon emission generating technologies utilizing renewable fuels, even if not explicitly enumerated in the bill (i.e. provides the Treasury Department the authority to grant eligibility for emerging zero-emissions technologies like wave, tidal, etc. to qualify without having to go through full Congressional amendment of bill). Extends the Clean Renewable Energy Bond (CREBs) incentive for investment in renewable energy by consumer-owned utilities (COUs) and other tax-exempt entities through Dec 31st, 2013. Extends to 2017 residential and business tax credits for solar hot water, PV, fuel cells, etc. Makes credit based on system power, not percentage of system cost (as currently). $3k per KW for PV, $1k per KW for fuel cells. Extends credits to end of 2012 for energy efficient home construction, and for non-business and commercial energy efficiency retrofits. Allows utilities to recover costs of "smart meters" on a 5-year cost recovery schedule, instead of current 20-year schedule. This is a good package of expanded credits and incentives for renewable energy and energy efficiency. I'm particularly happy to see my senator, Gordon Smith, co-sponsoring this bill. The long-term extensions of these important credits will provide the long-term planning and financial certainty the renewable energy industry needs to make investments, both in renewable energy projects, but also in manufacturing facilities in the U.S. The boom-and-bust cycle of the PTC in the past has severely hampered the pace of renewable energy development in the US and has also discouraged significant investment in manufacturing capacity. Without long-term certainty that a strong North American market for wind and other renewable energy technologies exists, manufacturers are reluctant to make major long-term investments in factories in the U.S. This has led to a shortage of wind turbines and other crucial components and meant that many turbines used in US wind farms have to be imported from overseas, increasing costs (especially considering the weakening of the dollar versus the euro and other currencies). I hope that this bill is incorporated into the package of energy legislation Congress plans to consider and pass in June and July. These incentives are crucial to the accelerated deployment of clean, homegrown, renewable energy technologies and increased energy efficiency. They will help level the playing field between highly subsidized fossil and nuclear energy industries and emerging renewable energy industries and the long-term certainty this bill provides will incentivize both quicken the pace of renewable energy development as well as increased US-based manufacturing of clean energy technologies - a win-win for the U.S. economy. On an interview this morning on NPR's Morning Edition, NASA chief administrator, Michael Griffin defended NASA's spending on a manned mission to Mars and planned permanent moon base and said that while NASA studies climate change, the agency has no authorization to "take actions to affect climate change in either one way or another." "I have no doubt that … a trend of global warming exists. I am not sure that it is fair to say that it is a problem we must wrestle with. To assume that it is a problem is to assume that the state of Earth's climate today is the optimal climate, the best climate that we could have or ever have had and that we need to take steps to make sure that it doesn't change. First of all, I don't think it's within the power of human beings to assure that the climate does not change, as millions of years of history have shown. And second of all, I guess I would ask which human beings — where and when — are to be accorded the privilege of deciding that this particular climate that we have right here today, right now is the best climate for all other human beings. I think that's a rather arrogant position for people to take." Now, Dr Griffin is presumably a smart guy. So why did he say something so patently dumb on national radio? Human civilization and the current biological community have evolved and adapted to living in current climatic conditions, which - relative to the changes we are now causing to the global climate - have been stable for tens of thousands of years. A change of ice-age magnitude proportions - several degrees Celsius of warming - would clearly wreak havoc on both human and non-human life. Dr Griffin has to know that, so why would he say something so stupid? Either way, congratulations Dr Griffin - you win today's Dumb Quote of the Day award! I have to say, I am ecstatic at the moment! I have personally been working to support the passage of this landmark renewable energy legislation since coming on board at Renewable Northwest Project in July 2006. Today is the culmination of almost a year of hard work helping to shape the nascent legislation and usher it through the legislature. It's still not quite over - the bill still needs to pass concurrence in the Senate and get signed into law - but today we've reached the top of the mountain! I'd like to offer my heartfelt thanks to everyone who helped pass this bill. It was truly a team effort and everyone who helped support SB 838 in the various stages of its life deserves to share in this moment of victory. I firmly believe that SB 838 is a strong and well-thought-out piece of legislation, the product of a long and involved stakeholder process during which the various views and concerns of a broad and diverse range of interests were considered and addressed. It will help put Oregon on a path to sustainable energy future while strengthening Oregon's economy, helping curb greenhouse gas emissions and protecting ratepayers from increasing and volatile fossil fuel costs. If you had asked me what single policy I would like to work on after graduating last year, I would have told you I wanted to help pass a renewable energy standard in my home state. I felt embarrassed every time I looked at a map of states supporting renewable energy and saw that Oregon was not amongst those with renewable energy standards. For a state that prides itself on its tradition of environmental leadership, this simply made no sense to me. Someone should do something about that, I thought, and I guess there's no reason why that someone, or someones in reality, shouldn't include me. Now, after a year with the Renewable Northwest Project, I have had the privilege and opportunity to help pass renewable energy standards in both Oregon and Washington, adding these two Northwest states to those that strongly support clean, homegrown renewable energy. Today is a proud day to be an Oregonian! The Board of Trustees at Illinois State University approved a new undergraduate renewable energy degree this month. The multi-disciplinary bachelor's degree will provides a broad overview of renewable energy industries. The new degree will include a technical sequence as well as an economics and public policy sequence. The degree will be administered by the Department of Technology, but will draw from existing courses in the Agriculture, Economics, Health Sciences, Geography-Geology, Mathematics Politics and Government and Physics departments. The program will add one new faculty position and 40 majors are anticipated to enroll by the fourth year of the program. The University recognizes that renewable energy is a fast-growing industry that will call for many new workers in the future. Support for the program will initially come from a U.S. Department of Energy grant, and department resources will be used for long-term program support. This is excellent! I wish I had had this kind of program at my university during my undergraduate studies. This is the first undergraduate degree of this kind I know of. If others are aware of other undergraduate renewable energy degrees at other universities or colleges, please mention them in the comments section. This kind of degree should be offered all over the country. We need to be training many of our brightest young minds to tackle the challenges ahead on the road to a sustainable energy future. And according to Grist article, colleges and universities would be smart to start offering more energy-focused courses. Enrollment in energy classes is "off the charts" at UC Berkeley, Grist reports, and more and more students are reporting that they plan to enter the renewable energy field after graduation. Just another sign that young people grasp the scope of the challenges and opportunities ahead in the efforts to fight global warming, end our addiction to fossil fuels and transition to a sustainable energy future! In a perfect example of conflicting agendas, as Congress considers new legislation to battle global warming, a Depression-era program to help electrify rural areas is still providing low-interest loans to rural electric cooperatives to build new coal-fired power plants. This government program, often the only source of financing for rural coops with less than perfect credit ratings, is a major force behind the rush to build dozens of new coal plants in the U.S. These new conventional, or pulverized coal plants spew carbon dioxide, the main greenhouse gas and contributor to global warming. According to the Seattle Times, the beneficiaries of the government's largesse — the nation's rural electric cooperatives — plan to spend $35 billion to build conventional coal plants over the next 10 years, enough to offset all state and federal efforts to reduce U.S. greenhouse-gas emissions over that time. The funding comes from the Agriculture Department's Rural Utilities Service, a program set up by the Rural Electrification Administration created in 1935 by President Franklin Roosevelt to bring electricity to farms in an era when established utilities were unwilling to bring power to rural areas. More than 70 years later, the goal of providing electricity to rural areas has clearly been accomplished, but the federal program is still in place and the government continues to use tax-payer dollars to make subsidized loans to rural cooperatives. Those cooperatives are now interested in using that money to construct new coal plants. According to the Times, in a rare moment of agreement, both environmentalists and the White House's Office of Management and Budget want to end loans for new power plants and limit loans for transmission projects in the most remote rural areas. However, the powerful National Rural Electric Cooperative Association is fighting to keep the program intact and recently deployed 3,000 members on Capitol Hill to lobby Congress in support of the program. The Cooperative Association argues that the loans for new coal plants are needed to keep electricity cheap and reliable in rural areas. Environmentalists counter that the subsidized loans and artificially cheap power removes any pressure for the rural co-ops to promote energy efficiency or aggressively tap renewable resources. They also point out that rural coops already rely on coal for 80 percent of their electricity, compared with 50 percent for the national average, and electricity demand at rural co-ops is growing at twice the national rate. Although technically private business (unlike their public utility district brethren), rural-utility cooperatives are non-profit and owned by their customers. There are more than 800 co-ops that distribute electricity in the United States and more than 50 that own power plants. James Newby, assistant administrator of the Rural Utilities Service, estimates that federal loan rates are 2 to 2.25 percentage points lower than the rates for commercial loans. Some budget experts say the favorable federal loans have reduced the cost of new power generation by 15 percent, the Times reports. In a clear sign that the original purpose of rural electrification has long-sense been perverted into a simple subsidy, many of the utility co-ops that are considered "rural" now provide electricity to expanding suburbs, such as the Dallas-Fort Worth metropolitan area, the Atlanta area and parts of northern Virginia. "Rather than declare the mission accomplished and disband the expensive subsidy program, Congress continued it and allowed it to become even more generous," a 2004 Heritage Foundation report said. Ronald Utt, co-author of the report and a former official at the OMB, calls the program a "remnant of the New Deal." "Poverty is no longer a characteristic of the agricultural community as it was during the Depression ... and as areas have grown, the basic clientele are well-to-do people who have nothing to do with agriculture," Utt told the Times. Glenn English, chief executive of the National Rural Electric Cooperative Association, said rural areas still need help to meet growing power demands at reasonable costs and that burning coal makes sense. He said per capita income of co-op members and consumers is 15 percent below the national average. English acknowledged that global warming has shifted the debate. But, he said, any climate-change legislation should show leniency toward the rural co-ops. "Rural electric generating cooperatives ... are in economic situations that make it very hard for them to invest in cutting-edge technologies," he wrote in a letter to the House Energy and Commerce Committee. The key to the longevity of the Agriculture Department's programs for rural utilities has been powerful political voice of the rural coops lobbyists. More than 30,000 members gave an average of $41 last year to the coop association for political contributions. Given their geographic scope, the coops can mobilize letter-writing campaigns across a vast number of states and congressional districts. English recently rallied the association's members to fight proposed laws on climate change that he alleges would hurt the rural coops. Such proposals would potentially mean higher electricity rates, he said, and that would anger voters. "So are we supposed to tell members of Congress that you've got to be willing to sacrifice your seat for the sake of energy efficiency?" he said. "I don't think the political community wants to take out the knife and commit hara-kiri." The Seminole Electric Cooperative in Tampa, Fla., is planning a $1.8 billion, 750-megawatt coal plant that would boost the utility's generating capacity by 60 percent. The co-op applied for a $1.4 billion loan. If approved, the interest rate for the heavily indebted co-op, which Standard & Poor's says has less than a month's worth of cash, would be as low as the rates for the most rock-solid corporate bonds. A group of rural cooperatives plans to build two, 700-megawatt plants in western Kansas. The East Kentucky Power Cooperative, which is fighting the Justice Department over alleged violations of the Clean Air Act, has received approval for Rural Utilities Service loans to pay for new coal-fired capacity. This program clearly has to die! There is simply no reasonable argument at this point in history that supports federal subsidies for the construction of new carbon-belching pulverized coal plants. The government should be seriously considering banning all new coal plants that do not sequester their greenhouse gas emissions, and certainly should not be subsidizing their construction. Rural electricity cooperatives and their public power brethren have been face down in the public subsidy trough since their genesis during the New Deal era. At that point, the subsidies were clearly necessary to help bring electricity to America's rural poor. But while most everything else has changed since the 1930s, the coops' reliance on federal subsidies has not. The National Rural Electric Cooperatives Association has been one of the major opponents of renewable energy standards at both state and federal levels as well as any climate change legislation or practically anything else that might add regulation to this almost entirely unregulated electricity sector. It's time for things to change. Global warming is a threat that far outweighs any concerns about stepping on the toes of rural coops and their tradition of local control and subsidy. Rural cooperatives, like all utilities and indeed all sectors of the economy that contribute to greenhouse gas emissions, are going to have to get used to the idea of increased regulation. We can't afford to simply leave coops out of climate change legislation, nor can we afford to continue to subsidize their construction of coal-fired power plants. If rural coops want to continue receiving subsidies, they should be redirected towards construction of renewable energy projects and the deployment of energy efficiency technologies. $35 billion can buy a lot of wind turbines and can help weatherize a lot of rural homes, saving rural coop customers money. It's time to end federal subsidies for power plants that contribute to global warming and redirect these subsidies to clean, sustainable, domestic energy sources. GURGAON, India — This suburb south of New Delhi is where the fruits of India’s economic advance are on full display: sprawling malls, skyscrapers housing India’s acclaimed software companies, condominiums with names as fanciful as Nirvana Country. But this fashionable address of the new India is also a portrait of ambition bumping up against reality, namely an electricity crisis that represents one of the major hurdles to India’s ability to hoist itself into the front ranks of the global economy. Look up at the tops of buildings, and on any given day, you are likely to find three, four or six smokestacks poking out of each, blowing gray-black plumes into the clouds. If the smokestacks are being used, it means the power is off and the building — whether bright new mall, condominium or office — is probably being powered by diesel-fed generators. This being India, a country of more than one billion people, the scale is staggering. In just one case, Tata Consultancy Services, a technology company, maintains five giant generators, along with a nearly 5,300-gallon tank of diesel fuel underground, as if it were a gasoline station. The reserve fuel can power the lights, computers and air-conditioners for up to 15 days to keep Tata’s six-story building humming during these hot, dry summer months, when temperatures routinely soar above 100 degrees and power cuts can average eight hours a day. The Gurgaon skyline is studded with hundreds of buildings like this. In Gurgaon alone, the state power authority estimates that the gap between demand and supply hovers around 20 percent, and that is probably a conservative estimate. For all those who suffer from crippling power cuts in cities like this, there are others who have no connection to electricity at all. According to the Planning Commission of India, 600 million people — roughly half the population — are off the electric grid. For this reason, it is impossible to estimate accurately the total national shortfall. But no matter how it is calculated, there is no doubt that India’s electricity crisis is becoming all the more acute for the roaring pace of the country’s economic growth and the new material aspirations it has generated. Rachna Tandon, a prosperous housewife, is a good example. She moved here to a quiet street of row houses 14 years ago, settling in what was one of the first residential sites built by DLF Universal, Gurgaon’s and India’s largest builder. Back then, electricity was in short supply, but she was fully confident things would improve. 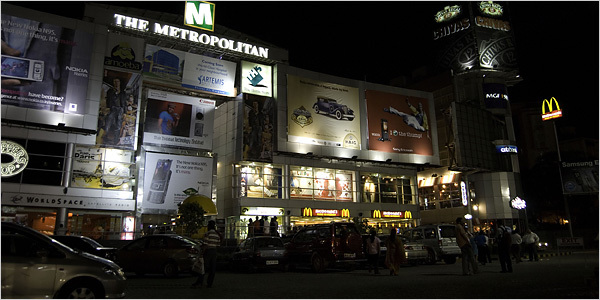 The advertisements at the time described Gurgaon as the best address south of Delhi. It was pitched as a millennium city. Today Ms. Tandon says she prefers to think of it as a medieval city. The day before, the power went out for roughly 11 hours. Her power inverter, which is basically a series of rechargeable batteries — a household necessity here — failed after four hours. For respite, some of her neighbors drove around in their air-conditioned cars. Her own children lingered outside and finally, when they nodded off to sleep, they lay on the living room floor, the coolest spot in the house. Each appliance in her well-stocked home — an air-conditioner in each room, a flat-screen television, a microwave and an electric stove — speaks to the gap between India’s dreams and its realities. The power cuts thawed the chicken sausage in her freezer and she had to throw it away, just in case it had spoiled. She did not dare use her electric oven, for fear that the power would go out in the middle of baking. With no television, her 10-year-old son has been so bored that he took out his old cricket bat and ended up putting a ball through the kitchen window. Her daughter, 13, has had to study by flashlight. This summer, Ms. Tandon said, the family will have to choose between buying a generator and going on vacation. “We’re living in the Dark Ages,” she said. For all her middle-class suffering, a reminder of the other India came earlier in the week, when her mother called from her hometown in rural north India and said she had had electricity for just one hour during the day. In part because of these limitations, Indians are, for now, relatively conservative consumers of energy: about 600 units per capita per year, or one-fifth that of a typical American. But that will certainly increase as Indian desires reach those of the wealthy Western countries. A recent report by McKinsey Global Institute frothily predicted a fourfold increase in consumer spending by 2025, vaulting India, as it said, “into the premier league among the world’s consumer markets.” McKinsey forecast that India would surpass Germany as the fifth-largest market in the world. Driven by the increasing need for power, India has stepped up generation in recent years at the pace of about 6 percent a year. It is a pittance compared with what neighboring China adds on each year and in any case insufficient to keep up with India’s galloping demand. The government has promised electric connections for all — which means access to the grid, not round-the-clock power — by 2009. That is a target that does not seem plausible at current rates of power generation. The development of power plants, meanwhile, is constrained by a lack of access to land, fuel and water, all of which a power plant needs in large quantities. The power grid remains weak. In Gurgaon, for instance, transformers routinely blow out because of heavy loads. Voltage fluctuations damage electrical appliances of all sorts. What the state cannot provide efficiently, many take for themselves. The World Bank estimates that at least $4 billion in electricity is unaccounted for each year — that is to say, stolen. Transparency International estimated in 2005 that Indians paid $480 million in bribes to put in new connections or correct bills. The country’s energy needs are one of the government’s main arguments for a nuclear deal with the United States, which would allow India to buy reactors and fuel from the world market. But even if the deal goes through, it would lift nuclear power, which provides 3 percent of India’s energy, to no more than 9 percent, said Leena Srivastava, executive director of the Energy and Resources Institute, a private research group. Similarly, in the coming years, alternative sources of energy, like wind, are expected to double, but to no more than about 8 percent of supply. Coal will continue to dominate power generation, and already more than a third of India’s coal plants do not meet national emissions standards. For Indian business, coping with chronic power shortages is a part of the cost of business. At Tata, company managers took pains to say that power shortages did not hinder their ability to meet deadlines for their clients. “The work as such does not suffer,” said Gurinder Virk, an assistant general manager. “We have sufficient stocks of diesel at all times.” Behind the building, three generators purred as a sweltering evening descended. A 2004 World Bank survey found that 60 percent of companies in India have such facilities. Still, construction here surges ahead. With few exceptions, there is little effort to reduce power consumption, beyond the use of low-energy light bulbs. Gurgaon is dotted with buildings that are effectively curtains of glass, soaking up the searing summer heat. “It’s good for New York, not Gurgaon,” was the verdict of Niranjan Khatri, a general manager with ITC, an Indian conglomerate whose office tower here is one of the few to comply with so-called green building codes. Never mind that Gurgaon does not have a sewage treatment plant of its own, or that the city’s Metropolitan Mall burns an average of 1,600 gallons of diesel a day to run its generators during power cuts. Farther south, in Nirvana Country, there are only generators. The 800-unit complex of row houses and apartment blocks, still under construction, is not even connected to the electric grid. It swallows 6,000 gallons of diesel each week to meet its needs — with only a fifth of its units occupied. Gas prices in the United States are now higher than any point in history, even when adjusted for inflation. Gasoline prices soared to levels never seen before as even the inflation-adjusted price for a gallon of unleaded topped the 1981 record spike in price that had stood for 26 years. And higher prices could be on the way as Americans get ready to hit the road for the Memorial Day holiday and the start of the summer driving season. The Lundberg Survey, a bi-weekly gas price tracking service, put the price of a gallon of unleaded at $3.18 in its latest reading released late Sunday, up more than 11 cents from its reading of two weeks ago. While gasoline had already been in record territory in current dollars, Trilby Lundberg, publisher of the survey, said this is the first time that her survey topped her 1981 record high when adjusted for inflation. The price of $1.35 in 1981 works out to $3.15 in current dollars, she said. The Iran-Iraq war, which started the year before, choked off oil supplies to the global market, causing that spike in prices. The motorist group AAA does a daily survey of up to 85,000 gas stations, but that reading does not go back to the 1981 spike. It's survey has been showing a series of record high prices in current dollars since May 13, and Monday the average price for a gallon of self-serve unleaded hit $3.196, the ninth straight record high and up from Sunday's record of $3.178. The AAA survey now shows prices up 4 percent over the course of the last week, along with an increase of 11.8 percent over the last month. AAA warned in congressional testimony last week it believes that more record prices could be on the way. It is forecasting prices will approach $3.25 a gallon over the next 60 days. Still AAA is predicting a record number of Americans will be hitting the road holiday weekend, with 38.3 million expected to be traveling 100 miles or more over the Memorial Day holiday, up 1.7 percent from a year ago. And most of those - 32.1 million - will be driving on their trip, according to the motorist group. Before this recent run of record-high gas prices, the highest price ever recorded in current dollars was $3.057 in the AAA survey, which was set Sept. 4 and Sept. 5, 2005, in the wake of Hurricane Katrina. That storm disrupted refinery operations and pipelines and caused a temporary spike, sending prices above the $3 mark for eight days. The only other time that the AAA national average has topped the $3 mark was in August 2006, after Israel invaded Lebanon and oil futures shot higher. Gas prices then reached as high as $3.036 during that 19-day spike. The current price increases are due to problems in gasoline supplies and refinery output. The average gas price went above $3 a gallon on May 4, and has been climbing since. Unless prices fall suddenly, Wednesday will mark the longest stretch of $3 gas on the AAA survey's history. Few states have an average gas price below $3. California had the highest average price, with a gallon of self-serve unleaded costing $3.457, up slightly from the $3.453 reading Sunday after several days of prices slipping slightly there. New Jersey retained the lead in the race to have the cheapest average gas price, but it is quickly approaching the $3 a gallon threshold itself. The average price there came in at $2.938 a gallon in the Monday reading, up from $2.93 Sunday. New Jersey is one of only three states with an average price below the $3 mark. The other two - South Carolina and New Hampshire - are both within a penny or less of that mark, after both rose in the latest reading. Four more states - Alabama, Mississippi, Tennessee and Virginia - became the latest states to cross that $3 a gallon benchmark in the Sunday survey. While crude oil prices have fallen over the last few weeks and oil supplies are high in the United States, problems at several refineries have crimped gasoline output ahead of the summer driving season. The refinery problems include fires, power outages, and longer-than-usual maintenance periods. The run-up in prices is a big concern for store chains, according to the retailers' trade group. 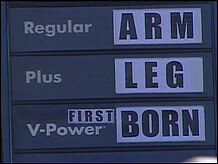 Its survey released early Friday found the average consumer believes that the price of gas will reach $3.32 per gallon by Father's Day. As a result, 40.2 percent of consumers are taking fewer shopping trips, while 37.9 percent told the survey they plan to shop closer to home. In addition, 30.7 percent said they are shopping for sales more often and 23.5 percent are using more coupons. Perhaps of greatest concern to the retailers, 24.1 percent said they are spending less on clothing, while only one in five have delayed major purchases, such as a car, television or furniture, and 31.1 percent are dining out less. "Consumers are entering the summer season with a cautious view of increasing gas prices," NRF President and CEO Tracy Mullin said. "To offset the effects of higher prices, more consumers are giving their wallets a little extra cushion by cutting back on discretionary spending or choosing to frequent retailers closer to home." Interestingly enough, the retailers' survey also found that 32.6 percent have decreased their vacation travel plans this year, despite the AAA survey that projected a record number of Americans on the highways this weekend. Major retailers were reporting weak April sales even before the recent spike in gasoline prices started earlier this month. Wal-Mart Stores, the world's largest retailer, had its worst sales comparison on record in April as it forecast essentially flat sales at stores open at least a year in May, a closely watched measure of retail strength known as same-store sales. Overall same-store sales in April were among the weakest on record as other major retailers including Target, Gap, Federated Department Stores and J.C. Penney all reported declines in that key sales measure. Big Oil went on the defensive Wednesday, getting grilled before a House panel and denying accusations that mismanagement and a lack of competition are the reasons behind this spring's record gasoline prices. The ability of the world's oceans to absorb carbon dioxide, the main greenhouse gas, may be in decline - a full forty years ahead of schedule. The Southern Ocean's ability to absorb carbon dioxide has decreased by 15% since 1981 and climate change is likely to blame, according to a new study published in Science. The Southern Ocean surrounds the continent of Antarctica and extends up to 60 degrees south latitude. An international team of researchers documented the decline in the Southern Ocean's ability to absorb carbon dioxide after four years of study. “The researchers found that the Southern Ocean is becoming less efficient at absorbing carbon dioxide due to an increase in wind strength over the Ocean, resulting from human-induced climate change,” said Dr Paul Fraser, who leads research into atmospheric greenhouse gases at Australia's CSIRO Marine and Atmospheric Research Division. Ocean's are an important natural absorber and reservoir, or "sink," for carbon dioxide emissions. Such a weakening in the ocean's ability to absorb and sequester carbon dioxide would mean higher atmospheric concentrations of carbon dioxide, which in turn would accelerate global warming. This potential feedback effect - where warming temperatures weaken natural carbon sinks, which in turn increase carbon dioxide levels in the atmosphere, driving further global warming - are taken into account by many new climate models. However, most models do not predict a weakening in oceanic carbon sinks for another forty years. While man-made greenhouse gas emissions from the burning of fossil fuels are only a small part of the total transfer of carbon dioxide in the carbon cycle, these man-made sources overwhelm a balanced natural system and lead to an increase in atmospheric levels of carbon dioxide, a greenhouse gas. This in turn causes global warming, which may weaken the ability of natural carbon sinks to absorb carbon, further accelerating climate change. Carbon dioxide is naturally exchanged between the atmosphere and the upper layers of oceans. However, as ocean waters circulate, some carbon dioxide is driven to deeper layers of the ocean where it is stored in the world's largest natural reservoir of carbon dioxide. The new study's researchers found that increased wind speeds over the Southern Ocean have influenced the process of mixing and upwelling in the ocean, which has resulted in an increased release of carbon dioxide from the oceans into the atmosphere. This decreases the net absorption of carbon carbon dioxide into the ocean and leaves more of the greenhouse gas in the atmosphere. The researchers also found that the increase in wind strength is due to a combination of higher levels of greenhouse gases in the atmosphere and long-term ozone depletion in the stratosphere, both driven by human activities. This new research suggests that stabilization of atmospheric concentrations of greenhouse gases at a level that will prevent dangerous climate change is even more difficult to achieve than previously thought. Additionally, the report's authors warn that acidification in the Southern Ocean is likely to reach dangerous levels earlier than the projected date of 2050. As oceans absorb carbon dioxide, it alters the pH of the ocean waters, making them more acidic. This will have adverse impacts on ocean species, including corals and some kinds of plankton. The international research team collected atmospheric CO2 data from 11 stations in the Southern Ocean and 40 stations across the globe. Measurements of atmospheric CO2 allowed them to infer how much carbon dioxide was taken up by sinks. The team was then able to see how efficient they were in comparison to one another at absorbing CO2. 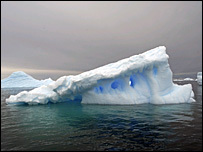 The international team comprised researchers from CSIRO in Australia, the Max-Planck Institute in Germany, the University of East Anglia and British Antarctic Survey in England, the Climate Monitoring and Diagnostics Laboratory in the US, NIWA in New Zealand, the South African Weather Service, LSCE/IPSL and CNRS in France, and the Centre for Atmospheric and Oceanic Studies in Japan. This is really scary news! The world’s oceans are one of two main carbon ’sinks’ - absorbers of carbon dioxide from the atmosphere, that in the natural carbon cycle help keep greenhouse gas levels in the atmosphere in check. As we destabilize the natural carbon cycle with man-made greenhouse gas emissions, we cause global warming which in turn is expected to weaken the ability of the oceans to absorb carbon dioxide, leading to a further buildup of atmospheric carbon dioxide levels, driving further warming. This is just one of many powerful feedback mechanisms that could push climate change beyond our ability to halt. Climate models and the IPCC reports take this feedback into account, but generally do not assume it will kick in until mid-century. If the ability of the world’s oceans to absorb carbon dioxide is already beginning to decrease, we will need to recalculate the speed and severity at which the world must cut greenhouse gas emissions in order to stabilize the climate and avoid disastrous climate change. It’s definitely time to get serious about cutting greenhouse gas emissions as hard and as fast as possible. And the United States needs to lead the way. We need to begin a bold plan to cut emissions as quickly as possible by the end of the next decade, perhaps by 30-60 percent, levels even greater than the supposedly ‘gold standard’ Sanders-Boxer Global Warming Pollution Reduction Act proposes (it calls for about a 15% cut by 2020). When we read news like this, it’s clear that time is definitely running out! 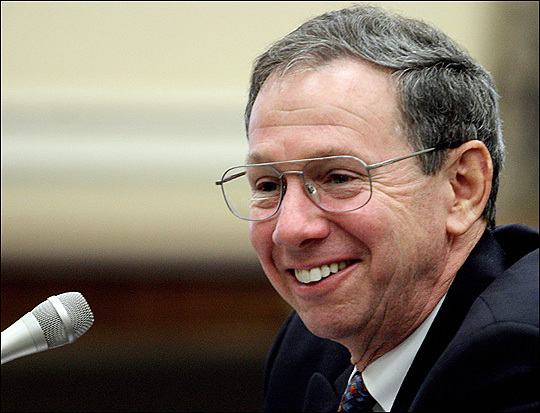 The following is a letter written by successful silicon valley entrepreneur, philanthropist and major political donor, Steve Kirsch, addressed to each of the major 2008 Democratic presidential candidates. Mr. Kirsch and I began corresponding about this letter a couple of weeks ago and after going through successive drafts, he is now interested in getting feedback from readers. "Global warming is the greatest threat to our planet that we have ever faced. Unfortunately, most scientists refuse to recommend a clear goal for the country to achieve because the choice of goal is a cost-benefit trade off. Scientists can tell us the costs, and only roughly quantify the benefits (because there is so much variation in the numbers). So it is left to the lawmakers to decide. The current Sanders-Boxer bill is a good start, but the goals were reduced to improve its chance of passage by Congress and Bush. But that's no excuse for why the Presidential candidates are not stepping up to the challenge. I composed this letter to each of the candidates to ask them to make a bold 30% by 2020 reduction in greenhouse gas emissions the centerpiece of their campaigns, and I'd love to get your feedback before I send it. In particular, is #12 true for you?" Personally, I know that any candidate willing to make a bold and aggressive greenhouse gas reduction goal the centerpiece of his or her campaign would earn my steadfast support. Are there others out there who would like to see a candidate make the commitments Mr. Kirsch asks for in this letter? Would such a candidate earn your support? We’ve met several times before, but you meet thousands of people so I’ll re-introduce myself. I’m a successful high tech entrepreneur and nationally recognized philanthropist. I’m also a generous supporter of Democratic candidates. In 2000, I donated close to $10 million to help Gore win. That was more money than anyone else in the country gave to any candidate. I’ve also donated over $1M to the DSCC, DCCC, and DNC. In this election, a Presidential candidate hasn’t emerged who I can get passionate about. I want to tell you why. For me, it boils down a simple question of leadership. Global warming is the single most important issue of our lifetime. Our top climate scientist, James Hansen, has said that the faster and deeper we cut our greenhouse gas (GHG) emissions in the next 10 years, the better our chances of averting a tipping point where the temperature rises every year at an ever increasing rate and we are completely powerless to stop it no matter what we do. Dramatic progress in the next 10 years is absolutely critical. If we do not make substantial cuts in the next 10 years, then our mitigation options disappear as David Hawkins of NRDC pointed out to me. If you were diagnosed with cancer and the best doctors in the country told you that you must treat it as aggressively and as quickly as possible in order to save your life, do you do less than they suggest? Sadly, that is what we are doing now. The Sanders-Boxer bill which you support doesn’t go far enough in the required reductions in next 10 years. It’s a start, but it’s far from the best our country can do. It is less than our leading scientists say we can and should do. The leading experts that I have consulted concur that a 30% reduction by 2020 is both technically and politically achievable. In fact, it’s not much more than California law now requires. In addition, a group of our top scientists will be meeting in June to lay out the details on the best way to achieve this goal. 1. Will you adopt a goal of cutting GHG emissions by at least 30% from 2007 levels by 2020 and encouraging other nations to do the same? 2. Will you make this goal a centerpiece of your campaign? 3. Are you willing to set a goal for the US higher than the 30% that our leading experts say is achievable and inspire the US to achieve a higher goal than many think is possible? A tougher goal, if the rest of the world follows our lead, would allow us to stop temperatures from increasing at an ever increasing rate in less than 20 years (at which time they would still increase, but at a declining rate instead of an ever-increasing rate). 12. It would motivate hundreds of thousands of people to put their heart and soul into helping you win because there would finally be a candidate who is supporting a goal that is both important to them and worth fighting for. In short, if we are to preserve the quality of life we now enjoy, we must have a President who has the courage to make an aggressive 10-year GHG reduction goal the nation’s top priority. We must have a President who will inspire and challenge us to rise to the greatest challenge of our lifetime and inspire other nations to follow. We must have a President who believes in America, who will invest in America, and who will allow us to do our best. We need a President who has the courage to set a goal for America and stick with it, a goal that some will say we cannot achieve, and who will hold us accountable for achieving it. America desperately needs such a leader. Is that you? That’s what we need now. We need a President who has the courage to set a strong, bold visionary goal that we can rally around – a goal that will both inspire America and the rest of the world. Because for this problem, we can’t give it just a good try. We must give it our best shot. And we need someone who has the courage to ask us to do our best. In a sign of congressional concern over near record-high gasoline prices and global warming, a Senate committee Tuesday approved legislation calling for the most significant increase in vehicle fuel efficiency in decades. The measure would boost the fleetwide average fuel economy standards to 35 mpg by 2020, up from 25. It now goes to the Senate, where a similar measure was defeated two years ago after heavy lobbying by automakers. This time, however, the bill was being backed by a number of lawmakers who previously opposed tougher standards. And it comes when congressional Democratic leaders have pledged to pass legislation to address climate change. Cars and light trucks, including sport utility vehicles, pickups and vans, account for about one-fifth of U.S. carbon dioxide emissions. "This marks a pretty significant change in the Congress," said Sen. Byron L. Dorgan (D-N.D.), who has voted against tougher fuel-economy rules but is now sponsoring legislation to raise the standards. The bill's approval by the Senate Commerce Committee marked only the opening round, with lawmakers from vehicle-manufacturing states vowing to fight a measure they believe could hurt the struggling U.S. auto industry. Environmental groups also assailed the bill, contending that it contained loopholes that could lead to lower increases than promised. The bill represents the first major revision of the fuel-economy program established during the oil price shocks of the 1970s. It would require the nationwide fleet of cars and light trucks sold in the country to average 35 mpg by 2020. A 4% annual increase in fuel economy would be required for vehicles made from 2021 to 2030. The legislation, however, would give the Transportation Department latitude to permit a lower standard if it determined that the costs of imposing stricter rules outweighed the benefits. Currently, each automaker's car fleet must average 27.5 mpg, a requirement that has not changed for about 18 years, and light trucks must average 22.2 mpg, which will go to 24 by 2011. The action came as gas prices moved back to center stage on Capitol Hill, with Democrats and Republicans sparring over each other's record in seeking to bring down energy costs. Rep. Bart Stupak (D-Mich.), chairman of the House Energy and Commerce subcommittee on oversight and investigations, announced that his panel would examine the causes behind fluctuations in fuel prices. During Tuesday's Senate Commerce Committee meeting, Sen. Barbara Boxer (D-Calif.) recalled driving past a filling station in San Francisco last weekend. "We couldn't believe our eyes — $4.25 a gallon!" she said. Desperate to do something to respond to the high prices, the committee attached to the fuel-economy bill a measure that would establish new federal penalties for gas price-gouging. Sen. Dianne Feinstein (D-Calif.), among the leading advocates for stricter fuel economy rules, cheered the committee vote. "Legislation to improve fuel economy has been bottled up for more than two decades," she said. "Now we have a realistic chance at a strong bill that increases fuel economy by 10 mpg over 10 years — and 4% a year beyond that." "On the one hand, it's a start," said Dan Becker, director of the Sierra Club's global warming program. "On the other hand, it's a pretty weak start. It doesn't actually require the administration to act, so there is no guarantee that fuel economy goes up." Joan Claybrook, a former administrator of the National Highway Traffic Safety Administration who is now president of the watchdog group Public Citizen, called the bill "a political compromise that now compromises the very purpose of the fuel economy program." They pledged to work to strengthen the measure as it moves through Congress, though that could set up a veto showdown with President Bush. Bush has called for tougher fuel economy rules, but opposes Congress mandating a standard. Feinstein, however, said the only way that the full benefits of the bill would not be achieved was "if the government shows that the costs to the country as a whole would be greater than the benefits." And she added: "I believe this would be highly unlikely given the spike in gasoline prices, the national security and environmental costs of our oil dependency, and the huge fuel savings that would be achieved as a result of this bill." Auto industry officials called the tougher standards "unattainable" and contended that they would deny consumers the SUVs they cherish. "If higher standards make vehicles less attractive to consumers, vehicle sales will drop, negatively impacting auto dealers, suppliers, automakers and the U.S. economy," the Alliance of Automobile Manufacturers, an industry trade group, said in a letter to lawmakers. The United Auto Workers also opposed the measure. Sen. Ted Stevens of Alaska, the committee's top Republican, said the bill was "not perfect, but it is a constructive step toward addressing the nation's energy crisis and reducing our dependence on foreign oil." Led by California, 31 states representing more than 70% of the U.S. population announced Tuesday that they would measure and jointly track greenhouse gas emissions by major industries [click the thumbnail at right to see a map of states involved in the registry]. The newly formed Climate Registry is the latest example of states going further than the federal government in taking steps to combat global warming. State officials, along with some industrial groups and environmentalists, say the registry is a crucial precursor to both mandatory and market-based regulation of industrial gases that contribute to warming. All agree that the most important part of the new registry is subjecting emissions statistics to third-party verification — unlike a Bush administration program that does not require verification. "You have to be able to count carbon pollution in order to cut carbon pollution," said Frances Beinecke, president of the Natural Resources Defense Council. "The registry gives business and policymakers an essential accounting tool for tracking the success of the many emerging global warming emission reduction initiatives that are blossoming across the country." The registry participants range from states that are moving aggressively to impose mandatory greenhouse gas reduction policies to others that are just beginning to examine whether to take even voluntary steps. "This includes a lot of deeply conservative states who have signed on that we weren't expecting," said Nancy Whalen, spokeswoman for the California Climate Action Registry, the only current statewide emissions tracking system, which helped develop the multistate program. "We're all going to be measuring in the same way, so there's not going to be a patchwork of different programs out there." California registry officials worked closely with New England states to develop the system. The new registry will be based in Washington, D.C., and will have regional offices. It will begin tracking data in January. Bob Malone, chairman and president of energy giant BP America, said: "We believe a credible reporting system of greenhouse gas emissions is the first step in developing government policy and corporate programs." BP produces and sells fuel to power plants, cars and trucks, the main contributors to greenhouse gases. The company is among several that applauded the creation of the registry, believing that in time they can profit from accurate reporting and reduction of their emissions. Joining the registry is easy. A governor just needs to sign off on its principles, which include agreeing to "provide an accurate, complete, consistent, transparent and verified set of greenhouse gas emissions data … supported by a robust accounting and verification infrastructure." The registry will be funded by industry fees, foundation donations and public money. Some Democrats criticized the Bush administration for not doing more, leaving states to act. "The Climate Registry is another example of how states are taking the lead in the absence of federal action to address greenhouse gas emissions in this country," said Arizona Gov. Janet Napolitano, a Democrat, whose state is a charter member. "Apparently the critics are not paying attention to what has been happening in Washington. In 2002 President Bush called for the creation of a national reporting registry, and the federal government followed that call by creating state-of-the-art reporting protocols where businesses and institutions submit comprehensive reports on their greenhouse gas emissions, sequestration and reductions." Hellmer added, "We welcome this action by the states as it is supplementing the extensive work already done at the federal level." But industry, environmental and state officials said that although the U.S. Department. of Energy has a registry, it did not require independent verification of data, among other key differences. Energy Department spokeswoman Megan Barnett said the department in April 2006 strengthened its reporting guidelines by recommending, but not requiring, that they be third-party verified. Kerry E. Kelly, a lobbyist for Waste Management, a national trash hauling firm that owns landfills that emit methane, another greenhouse gas, said that although there was nothing wrong with the federal program, the multistate approach would work better because of its uniform reporting standards. "I would think that it would become a model for the federal government to look at," said Kelly. Dale Bryk , an attorney for the NRDC, criticized the DOE registry for allowing participants to "cherry-pick and just report emissions data from facilities that are reducing pollution, without disclosing the emissions data from other facilities that are increasing pollution." Some said the registry was an improvement over the federal effort, but imperfect because it was still voluntary. "A mandatory registry would be better," said V. John White, head of a Sacramento-based energy and environment group. Gov. Arnold Schwarzenegger said of the new registry: "I'm proud that [it] was modeled after California's Climate Action Registry and trust that the rest of the nation will join our fight to protect the environment and secure a sound economy." In addition to the 31 states, the Campo Kumeyaay Nation of Native Americans in Campo, Calif., near the Mexican border, has joined. Two Canadian provinces, British Columbia and Manitoba, also have signed on.